Our Premiere® Camera Eyepieces will allow you to Bring your images to life on Your Computer and Bring your images to life on TV. 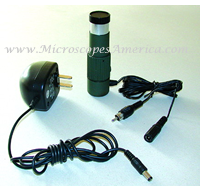 Inexpensive Way to Upgrade Any Stereo or Compound Microscope into a Digital Microscope. Perfect teaching in classroom environments, labroatory, or just for the young scientist! Bring your images to life on Your Computer. 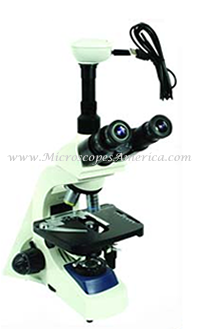 Inexpensive Way to Upgrade Any Stereo or Compound Microscope into a Digital Microscope. Microscope NOT included. This combination digital camera with built in 10X eyepiece is a great way to preview live color digital images directly from your microscope onto your computer via the USB port. This camera comes with easy to install software in order to view, edit and save images. Great way to share and email images to colleagues and friends. 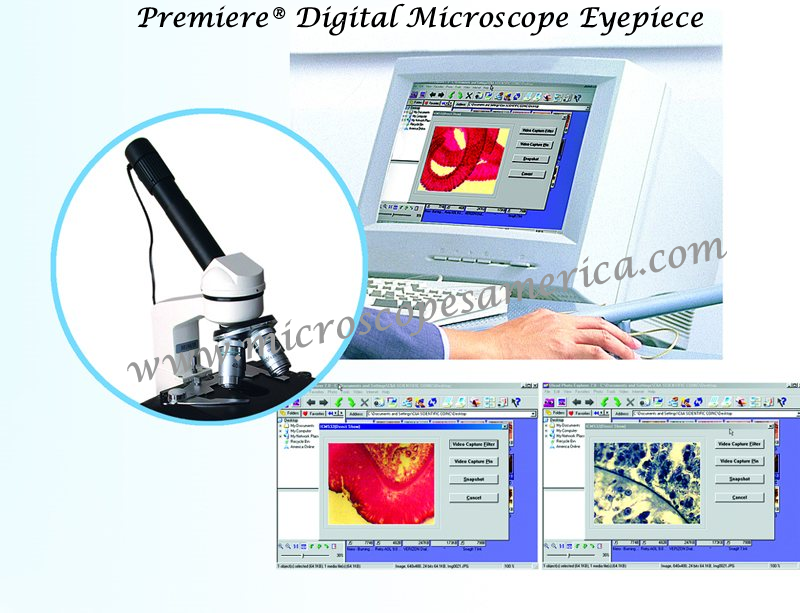 Our new High Resolution Optics Camera Digital Microscope Eyepiece includes the user friendly TS View Digital imaging software, is easy to use and is compatible with both Windows XP and Vista. • MA88-130: Premiere® High Resolution Optics Microscope Camera Offers 5.0 Megapixels with a 1280 x 1024 resolution. TS View Digital Imaging Software Included. Software is user friendly and compatible with Windows XP and Vitsa. • MA88-300: Premiere® High Resolution Optics Microscope Camera Offers 5.0 Megapixels with a 1280 x 1024 resolution. TS View Digital Imaging Software Included. Software is user friendly and compatible with Windows XP and Vitsa. 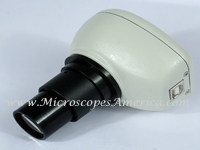 • MA88-500: Premiere® High Resolution Optics Microscope Camera Offers 5.0 Megapixels with a 1280 x 1024 resolution. TS View Digital Imaging Software Included. Software is user friendly and compatible with Windows XP and Vitsa. Offers 1.3 Megapixels with a 1280 x 1024 resolution. Offers 3.0 Megapixels with a 2048 x 1536 resolution. Offers 5.0 Megapixels with a 2592 x 1944 resolution. 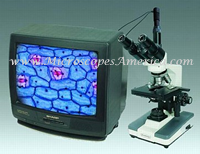 Explore the microscopic world on your TV. 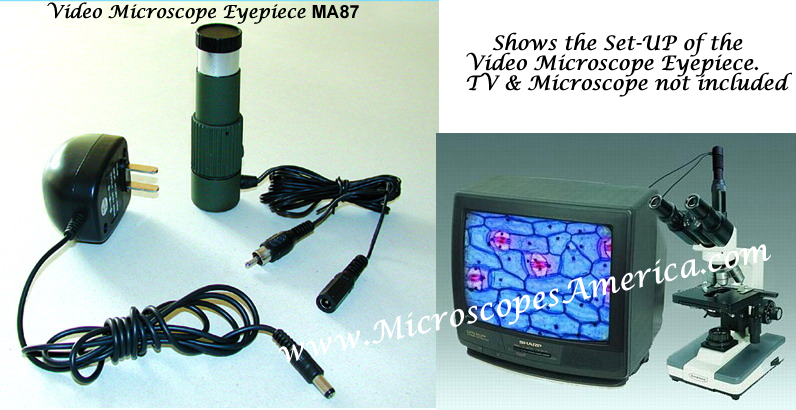 This Video Microscope Eyepiece MA87 is designed to bring the microscopic world to your TV. 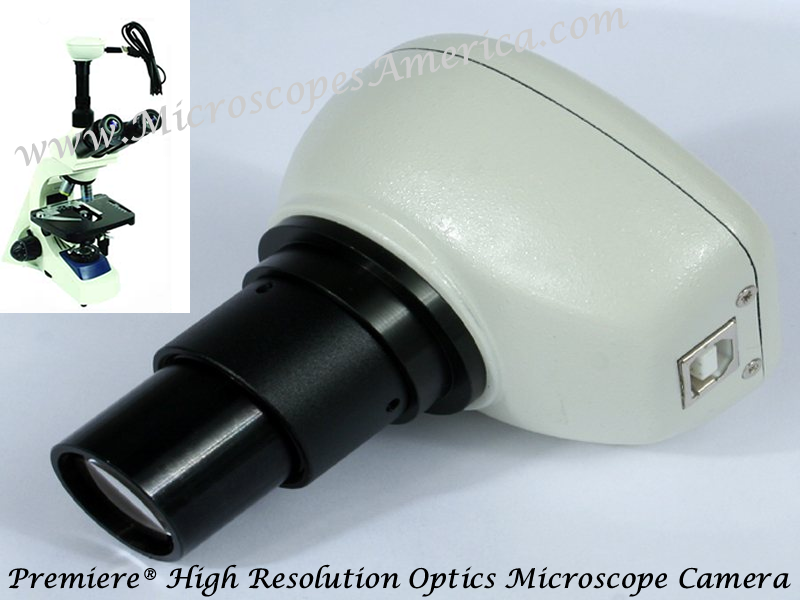 Similar to the Digital Eyepiece (above) ,this state of the art camera projects the exact same magnification on your TV that you would normally view in your microscope. Just replace the scope eyepiece with this and connect to the TV video input with the enclosed RCA jack. NO SOFTWARE NEEDED. It automatically fills in your entire monitor screen with image. • Individually boxed with 3 adapaters, AC power cord and RCA plug.